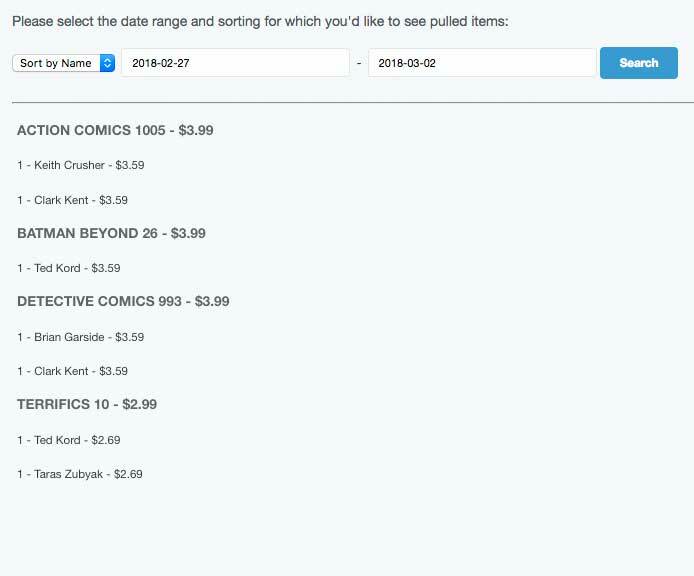 How to do your weekly comics pulls, generate pull orders, and create a pull list. This video will show you how to do your weekly pulls, if you scroll down, we have the instructions written out as well so you can see all of the steps. 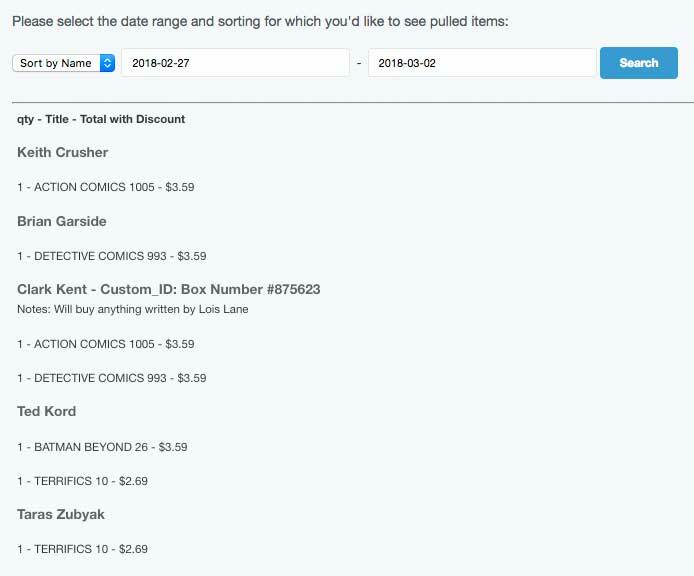 From the dashboard you can select “Pull Orders” (the pull orders button is also available on the “Orders” page. 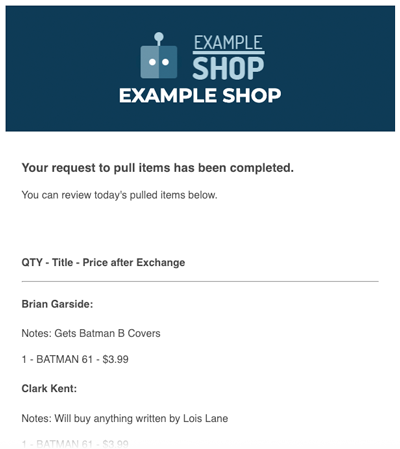 From the Pull Orders page, select the titles that have arrived in store. Titles are sorted alphabetically (the same way they are sorted on your Diamond Invoice). We preselect the titles based on the Diamond New Releases update. Important: This is a “Best guess” from Diamond, a lot of things can happen from shortages, to schedule slippage, so it is important that you review the list, and check or uncheck things that actually shipped to your store this week. Click the check box next to each title, titles that are on the New Releases list will be highlighted, pre-checked, and the prices are updated according to the price list on the Diamond Master File, you may still need to adjust the pricing as needed based on your invoice. When you are done, scroll to the bottom of the page and click the “Pull” button. A confirmation page will be shown, which asks you to ensure that everything you want to be pulled is on the screen. 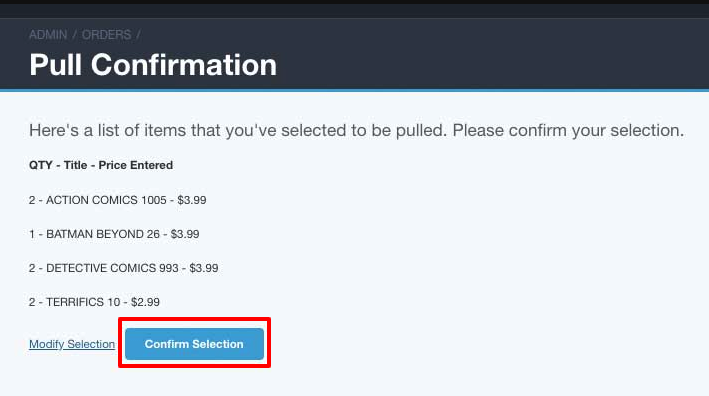 If it looks right, click the button labeled “Confirm Selection” If items are missing, you can click “Modify Selection” and go back to the previous screen. In 2-3 minutes you will get an email with your current pulls, but if it doesn’t arrive, you can simply click “View most recent pulls” from your dashboard and see the pulls you recently made. They are sorted by default by Subscriber, but you can choose to change it to sort by Title.